Cartilage imaging and diagnostics is challenging. Human cartilage layer in ankle area is only 1 mm thick in average, varying in knee roughly from 2 to 4 mm in weight bearing areas, and extending up to 5-7 mm in healthy knee cap area. Cartilage covers bone ends in joints. Bone ends can have very complex shape, like convex in two directions, but concave in third direction. Slice based imaging rarely gives a perpendicular view on these surfaces, and it is not so uncommon that even after modern imaging, additional cartilage lesions are found in arthroscopy. We still have situations, where patient is informed that there can not be a cartilage based problem because plain X-ray or MRI are normal. So, what is this all about? Going back to literature and clinical experience , it means that cartilage diagnostics is not an easy or straight forward thing. 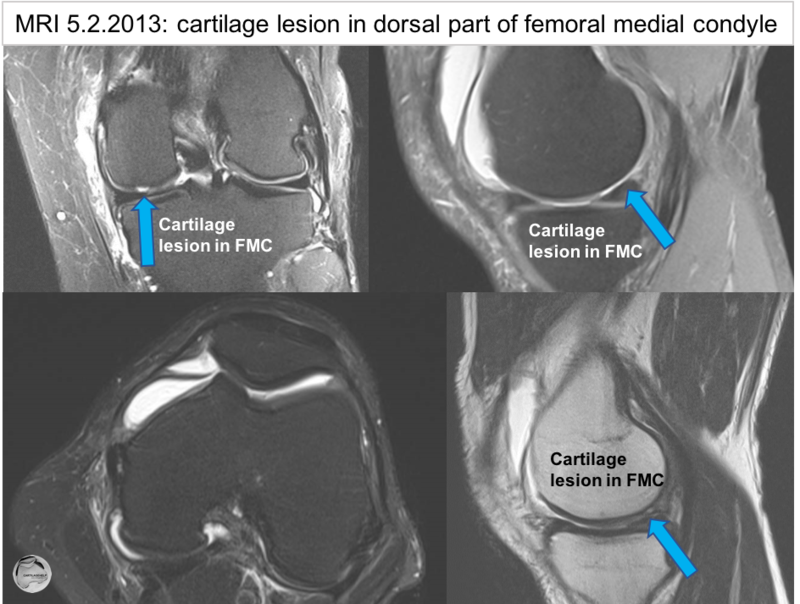 There is an increasing evidence on certain limits in cartilage imaging, suggesting that even 30% of cartilage lesions can be missed in routine magnetic resonance imaging. This underlines the problem, since there is no particular clinical test either to indicate or to exclude presence of cartilage lesion. It is quite commonly thought, that at least after arthroscopy there can not be a cartilage problem any more, if nothing was seen in operation. Once again, going back to clinical work, arthroscopy offers only limited visibility in some cases and certain areas, and the accuracy of arthroscopy in cartilage diagnostics is under discussion. It is estimated that even 10 to 20% of lesions can be missed or underestimated in routine arthroscopy procedure, especially on knee cap area and in posterior parts of weight bearing areas. Our experience is that contrast enhanced CBCT has remarkably increased the quality of our preoperative planning and it has proven to be an effective tool in finding cartilage lesions. At least in theory, 0,2 mm isotropic resolution should not miss any clinically relevant cartilage problem when the data is read. Diagnosis of imminent osteoarthrosis is primarily based on clinical evaluation, and on plain X-ray images. Kellgren-Lawrence classification is the traditional world-wide tool used in reading plain X-rays. It is good to notice that cartilage itself is not visible in plain X-ray imaging, but classification is based on so called joint space width, and bony changes in later phases of osteoarthrosis (OA). This imaging method can not reveal early steps of cartilage degeneration or cartilage injuries, but has a remarkable role both in planning component size and position in total joint replacement, as well as in measuring varus/valgus angle, also when considering osteotomies. Magnetic resonance imaging (MRI) and computed tomography (CT) have opened a 3D era in joint imaging. Initially MRI was limited in availability, but nowadays it is widely available in many countries. MRI gives valuable information on soft tissues, like ligaments, tendons and meniscus. It also reveals severe reasons for symptoms, like osteonecrosis, malignant tissue changes etc. 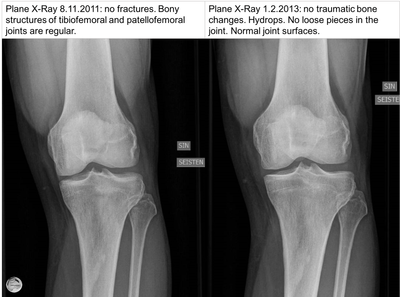 It has become a golden standard in knee imaging after plain X-ray. MRI itself is a term describing imaging technology in general, but the final quality of joint imaging is highly dependent on several factors, like the machine itself, coil and many other things. This has been noticed as difficulties in multicenter studies and in longitudinal studies, when comparing imaging data even in the same patient in longitudinal follow-up. As a screening method, MRI can find about 70 % of cartilage lesions. Major limitations are related to limited spatial resolution in clinically relevant imaging time. MRI imaging data is gathered as individual slices with a specific imaging sequency in three different planes. Different sequencies are intended to give information on different tissues, so combination of two full sequencies requires 2x3 imaging periods which all have to be included in the time patient is in the tube. Effective data gathering time is then less than 5 minutes per one projection. A typical slice thickness in routine clinical imaging is seldomly less than 3 mm, although even higher resolution can be calculated, or achieved by remarkably increasing imaging time. Joint can be loaded with contrast media for MRI, imaging is then called as magnetic arthrography (MRA). Large scale CT scanners are optimised for imaging of any part of the body, with capacity and power to image even chest and waist areas. This means that they are not directly optimised for smaller areas like individual joints. CT with contrast media has been used for cartilage imaging in special cases, e.g. when patient has a contraindication to MRI. Large scale CT scanners use helical scan, thus giving series of axial views of the joint. Data can be recalculated to give traditional slice series in three different planes. 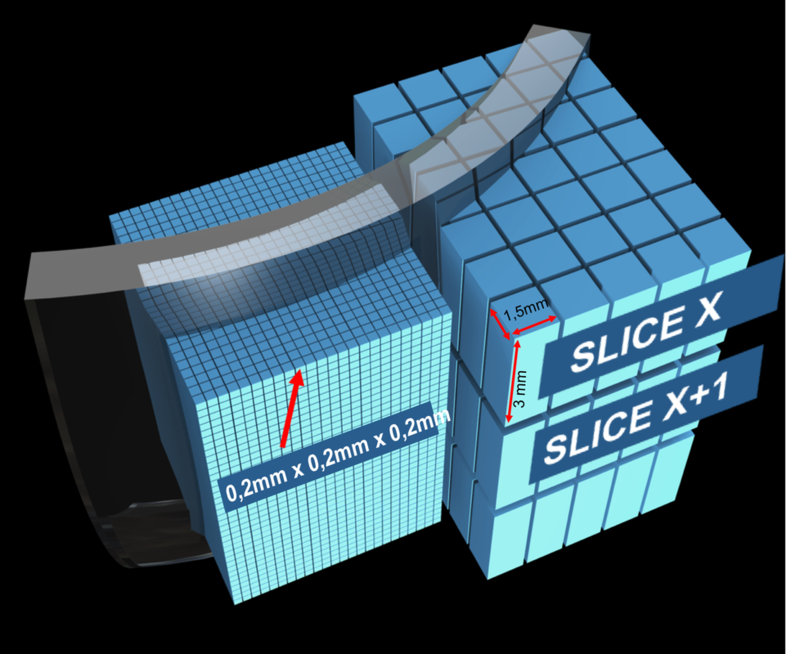 Slice thickness can be adjusted, being typically 0,5 to 1 mm. Cone beam CT (CBCT) is a new imaging method in orthopaedics. It is based on a subtotal single rotation of X-ray unit around the joint. CBCT technology produces isotropic data, meaning that the whole joint is recorded in 0.2 mm cubes, with no limitations in resolution in any direction. This kind of data is called isotropic, where the smallest image unit is a symmetric voxel. Voxel is a 3D pixel. These cubes form a data cloud, which is archived as such. This is the real power of high resolution CBCT imaging, offering a possibility to afterwards recalculate as many projections as needed, with free slice thickness and orientation. For the first time, it is now possible to see perpendicular view of curved joint facets in any part of the joint, or radial cross section of meniscus at any point. Archiving voxel cloud as such also means that comparison of long term changes in joint is now possible on the very same area with same slice orientation. Imaging itself requires use of intra-articular contrast media injection, like in large scale CT or in shoulder MRA. This can cause discomfort for couple of hours. After injection patient is adviced to bend the joint for 15 times to allow the contrast media evenly spread around the joint space. Imaging itself takes 18 seconds, patient is sitting on a chair with the knee or ankle lifted inside imaging gantry. Cone beam scanner is designed to be used both in non-weight bearing and in weight bearing imaging, this allows functional view of joints under load. In cartilage imaging non-weight bearing setting is preferred. 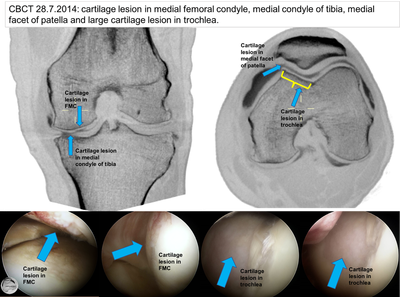 Final data shows cartilage and meniscus morphology far more detailed than earlier imaging methods. One additional advantage is accurate imaging of subchondral bone changes. In OCD cases contrast agent penetration under the OCD area can be followed, as well as bony healing after fixation of OCD lesions. 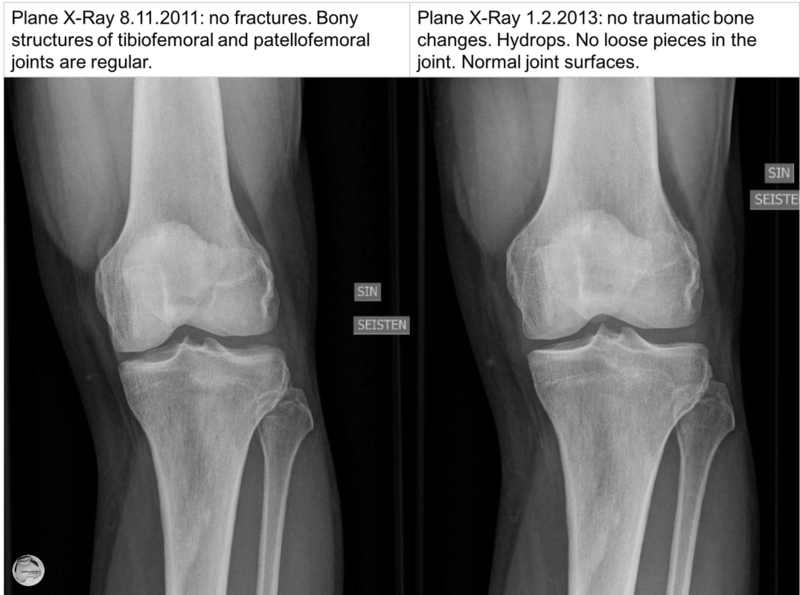 Following series shows X-ray, MRI and CBCT findings of the same patient's knee.